Holding one of the most important watches made in the 20th century is a big deal for a total watch fanatic like me. 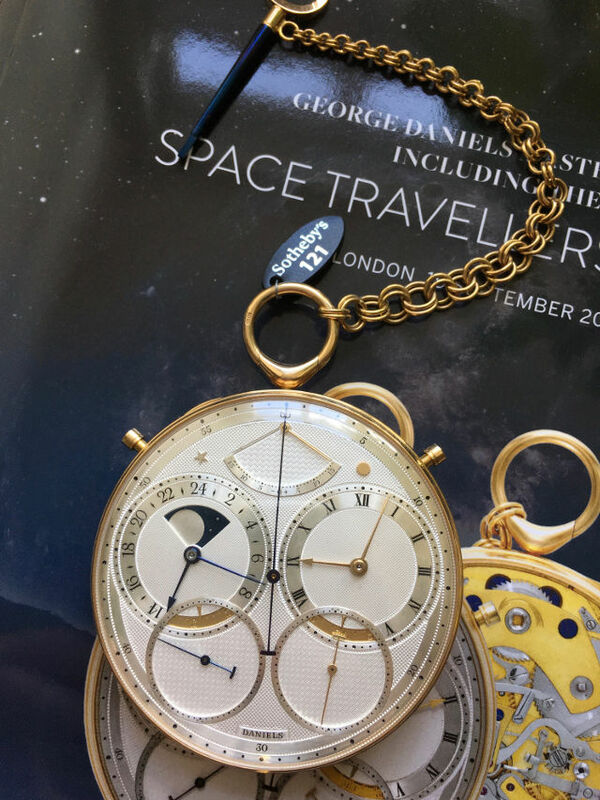 So just prior to its auction at Sotheby’s London, on 19th September 2017 with an estimate of £1.2 to £1.8 million [it finally sold for £3,196,250], I had a final viewing of George Daniels’ iconic Space Travellers’ watch and took the opportunity to photograph and video the watch in action. 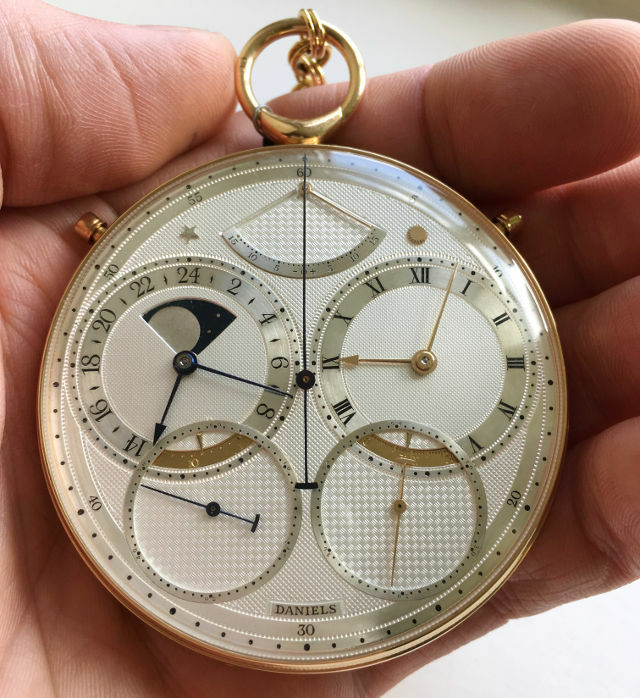 Apart from its immense mechanical complexity, it is quite simply one of the most beautiful and aesthetically pleasing watches ever made. 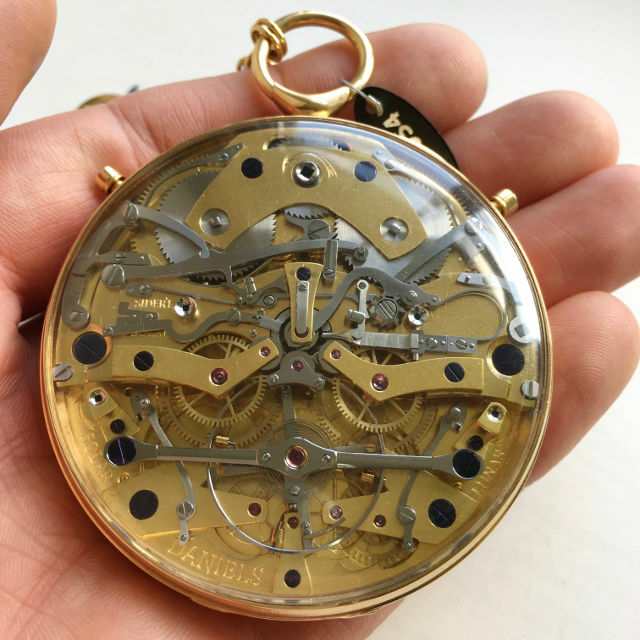 It’s astonishing to remember that George Daniels made his pocket watches entirely by hand, designing his movements and escapements himself and making almost every component, right down to the tiniest screws. To conceive and build a watch such as this is almost unimaginable. Viewing the movement in my hand I tried to put myself in the mind of the master, just to imagine the incredible sense of…let’s face it…brilliance he must have felt, looking down at his own creation. Viewing the watch in action is mesmerising, the two independent subsidiary seconds hands power away and the chronograph seconds hand jumps with a precise staccato motion as soon as the chronograph pusher is activated. Turn it over and the glazed back means you are immediately immersed in horological heaven. And who would buy a watch like this? Well frankly, with a spare million or so, who wouldn’t?